You won’t be able to stop yourself from chomping on this scrumptious Creamy Mushroom Pasta, which is so quick and easy yet very filling and rich. This will be the best option for you whenever you feel stuck and can’t decide what to cook for dinner. This Creamy Mushroom Pasta is an amazing vegetarian pasta, but you can add chicken broth in the sauce if you don’t have a vegetarian diet and want some more flavor in your pasta. The best thing about pasta is that you can create your own recipe with your favorite ingredients. 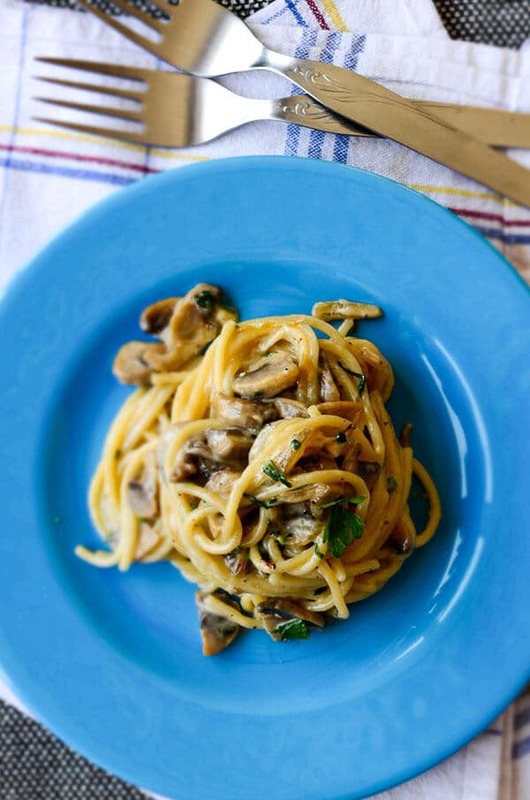 I prepared a creamy mushroom sauce for this pasta and it was super yummy! I started by sauteing roughly chopped onion and garlic in a large skillet. I added chopped mushroom when the onions are tender enough. Cook it until the mushrooms absorb almost all the juice they release. You can be sure that you will be tempted even by the smell coming from the skillet at this point. To make the final touch and make the sauce even more iresistible, you will add two more ingredients: heavy cream and goat cheese. These two absolutely make anything nicer, but mushroom is the best match to them and having all these in a pasta is heavenly! 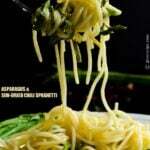 The cheese I use is not a melting one, so you can feel the crumbled pieces in your pasta. You can use parmesan mozarella or another vegetarian cheese to add more creaminess if you like. I mostly leave ground black pepper optional in recipes, but it is a must in this Creamy Mushroom Pasta because it gives a wonderful aroma to the sauce and complements the dish perfectly. 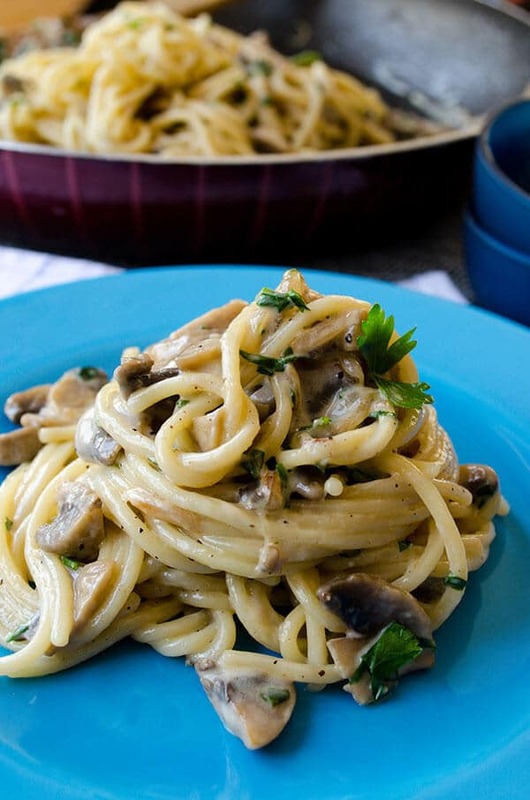 Creamy Mushroom Pasta will become a hit in your home and you will even crave for it when you have to eat dinner alone. Homemade pasta dishes are mostly made by students or single living people because they are easy, but I think they make perfect family meals too! If you don’t like creaminess in your pasta, but still want a sauce with mushroom, check out my recipe for mushroom with tomatoes, which we mostly have as a main dish. You can just mix it with pasta and make a perfect alternative to this one. Fast and easy pasta with a creamy mushroom sauce. Heat olive oil on high heat and sautee chopped onion and garlic over medium high heat. Add in sliced mushrooms when the onion is golden, stir. Sprinkle salt and cook it over medium high heat until almost all the juice is gone. Leave about 2 tablespoons of juice in the skillet. Pour heavy cream, stir well and cook for about 5 minutes over low heat. Set aside. Cook pasta according to the package instructions. Drain. Put the skillet back on the stove over medium high heat. 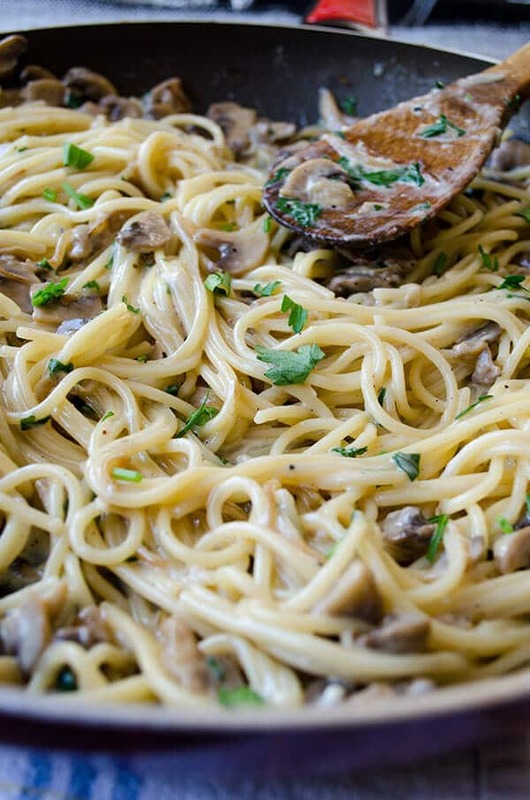 Transfer pasta into the skillet with the creamy mushroom sauce. Add crumbled goat cheese and milk. Mix well and cook about 5-10 minutes over low heat until the sauce coats all the pasta. Sprinkle black pepper and mix. Toss in parsley and serve warm. Hi Austyn! Never heard of calf rennet before. Never thought a cheese could be non-vegetarian either. Thank you for informing!